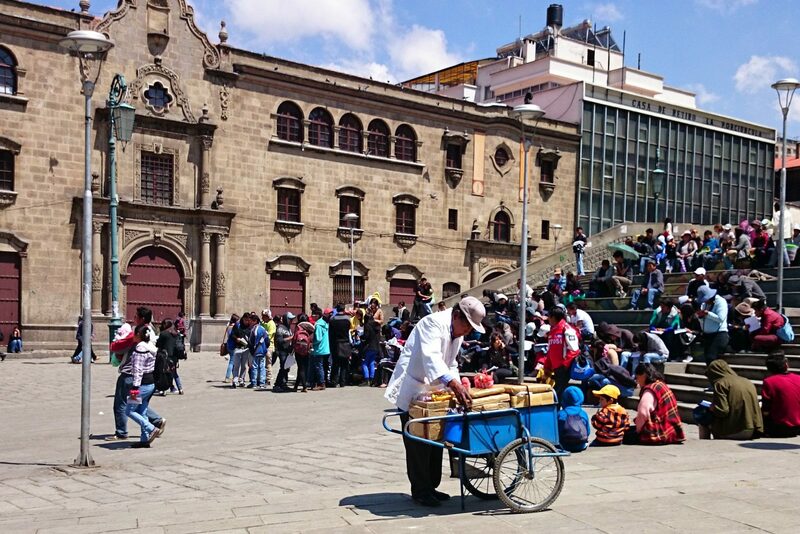 “I had been to La Paz, Bolivia, a couple of times but this time I decided I wanted to do an actual city tour, to get the most out of my visit. And rather than doing a standard city tour I chose a tour taking me behind the scenes of this sprawling city, the highest (administrative) capital of the world. On foot. Well, it wasn’t just on foot in fact. The beauty of our La Paz walking tour is that you mostly walk, yes, but when you don’t walk you use public transport instead of a big tourist coach. So I set of with my guide Marco in a local “trufi” – a shared taxi with a set route that will pick up customers as it goes along. First stop – El Alto. I had driven through La Paz’s Satellite City high up above the city but had never stopped here before. Now I was exploring it with Marco by my side, telling me all about the way of life in this fascinating city. Considered the “Aymara Capital of the World”, El Alto is a dynamic place with an influential role in the modern-day social, economic and political landscape of La Paz and Bolivia. It is one of Bolivia’s fastest growing urban centres, with a mainly indigenous population. Whilst largely poor, it recently experienced an enormous boom in wealth of big Aymara families who have built enormous (and architecturally extremely bizarre) houses here. In fact, some of La Paz’s most expensive houses are located here now, in the middle of poor neighbourhoods. We stopped at a bustling market and Marco took me past the many stalls, explaining the various products and engaging in conversation with the stall holders, putting me at ease and making me feel I was meeting the locals myself. Of course I had been to markets before, but having a guide with me to explain the fruit and vegetables I couldn’t identify, or the more obscure remedies and products gave me a much deeper insight. We then visited El Alto’s new art museum, beautifully installed in an old water tower with incredible views over the city. Apart from us, no other tourists were visiting, just locals. Again I felt off the beaten track. From El Alto we walked through the “hanging neighbourhoods”, built on the steep (and unstable!) slopes of the valley. Wherever we walked, the distance seemed short and the pace leisurely, so that albeit the altitude I didn’t feel too tired. Enroute Marco was giving me so much information about the Aymara way of life and the Cholita culture, as well as the social challenges facing El Alto. It was fascinating and I wished my head was a sponge to soak it all up. Time flew and before I knew we finished up on Plaza San Francisco, La Paz’s main square. I had to say Good Bye to Marco after what I think was the best city tour I have been on. Those with more time, however, can do a full day tour which would include a typical lunch and some exploration of the historic centre and downtown La Paz.